"To My Darling Deer... Happy Valentines Day!" 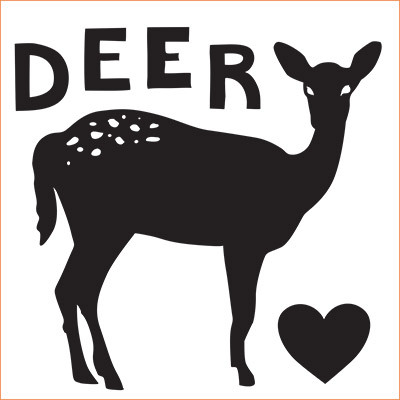 The deer is the sweetest Valentine. She's social, gentle, a dedicated friend, and an adoring carer to her young. Not to mention she has a true appreciation for fresh flowers! Sometimes, however, her love of flowers can interfere with our desire to create a fresh bouquet for our beloved, using homegrown beauties from the backyard. If you're finding that the local deer are disruptive to your bounty, there is a humane and non-harmful solution: plant flowers that they have no interest in! Put the toxic chemicals and harmful scare-tactics away! • Deer Template- this will become your stencil. PRINT your deer template as large as possible on standard sized paper. TAPE your template on top of a 12" x 12” piece of cardstock. Be sure to tape the template directly in the center of the page. CUT along the edge of the deer shape using an x-acto blade. Cut carefully through both the template and the cardstock. DROP the positive shape out, leaving the negative shape of the deer on the 12" x 12" cardstock. It takes patience so go slow! You now have a die-cut silhouette - very professional! RIP pieces of colored paper to fill the inside of your deer. We used a range of different colors and some left over cut out shapes from a different project. It works best to use paper scraps for this craft. GLUE over your cardboard backing and FILL it with your ripped paper. Mix colors and make sure each piece is securely glued in place. CHECK that you have filled all necessary areas of your background with colored paper. Do this by laying your black silhouette over the collage, making sure you have filled the space that will be seen through your die-cut deer and text. COVER your silhouette with glue (if you have spray fix, that works well too). Be sure you are gluing the correct side - you don't want it stuck backwards! LAY your silhouette over your collage, making sure both sides are adhered evenly to one another. FRAME IT! Your masterpiece is complete and lovely enough to frame and hang where ever you choose! Keeping the honeybee at the forefront of our minds. Artists big and small unite to make adorable stationery. Inspired to make a beautiful centerpiece but unsure of what vase to use? Doan Ly shows you how.